Need to add air brakes to a farm trailer? Or modify an existing system? Or maybe you need to install or modify an air suspension system? Air Brakes, Hydraulic Brakes, Air Suspension - We can help. An important part of our business is designing and supplying conversion kits for a variety of vehicles, including agricultural tractors and trailers, crop-sprayers, other agricultural vehicles, trucks, tractor units, semi-trailers, other commercial or industrial vehicles, boat trailers and systems for narrow-gauge railways. The conversions are mainly for air braking systems, hydraulic braking systems and air suspension systems, plus other related conversions such as tyre-inflators and air-assisted doors. Each kit comes with a full-colour layout drawing and parts list. We supply parts, advice and technical backup, and every kit includes our publication: "Driver's and Owner's Handbook" which includes maintenance schedules for air brake and air suspension systems. We can design a new system or modify an existing system to improve its performance or to comply with the latest construction and use regulations and EU legislation. Many farm trailers, for instance, are underbraked and some have no working brakes at all. Anti-lock braking systems (ABS) are now commonplace on agricultural as well as commercial vehicles, and many of these systems need upgrading. We also supply lift-axle conversions and suspension-lowering systems for vehicles with air-suspension, and can incorporate the latest electro-pneumatic devices. No two conversions are identical; we design each system to suit your requirements. Please note that with effect from Monday 19th June 2017 we shall be reducing our hours of trading and working a three-day week. Our office will be open as normal on Mondays, Tuesdays and Wednesdays, but will be closed for business on Thursdays and Fridays. This means that we will be unable to accept any deliveries or arrange for any collections to be made on a Thursday or a Friday. Furthermore, any routine telephone enquiries received on a Thursday or a Friday will be dealt with on the following Monday. However, if your enquiry is urgent you are welcome to email us as we intend to respond to your emails as normal. We realise these changes will cause some inconvenience but they are being forced upon us. My co-director, who is also my wife Franca, enjoys reminding me that I am rapidly approaching retirement age and that our working hours will have to be reduced sooner or later. Moreover, we both now have further commitments which include spending more of our time with our ailing relatives, and so I am sure you will understand the situation we are in and why these changes are necessary. Listed below is just a small selection from the hundreds of conversion kits we have designed and supplied over the last few years. Each kit comes complete with a drawing and parts list. If you need any information about conversion work, please contact us and we will be pleased to help you. Two-line ABS modular braking system for tri-axle semi-trailer with air suspension, using load-sensing valve, brake chambers and shunt valve. Two-line air braking system for tandem-axle agricultural trailer, with air/hydraulic brake actuators and shunt valve. Air suspension system for tri-axle agricultural trailer, with suspension dump, controlled by Erentek EASD 001 valve assembly. Addition of belt-driven twin-cylinder air compressor on to agricultural tractor, with two-line air equipment for trailer control and optional front air couplings. Two-line braking system for tandem-axle trailer, with 2S/1M 12-volt Modal ABS, air/hydraulic brake chambers and combined load-sensing relay-emergency valve. 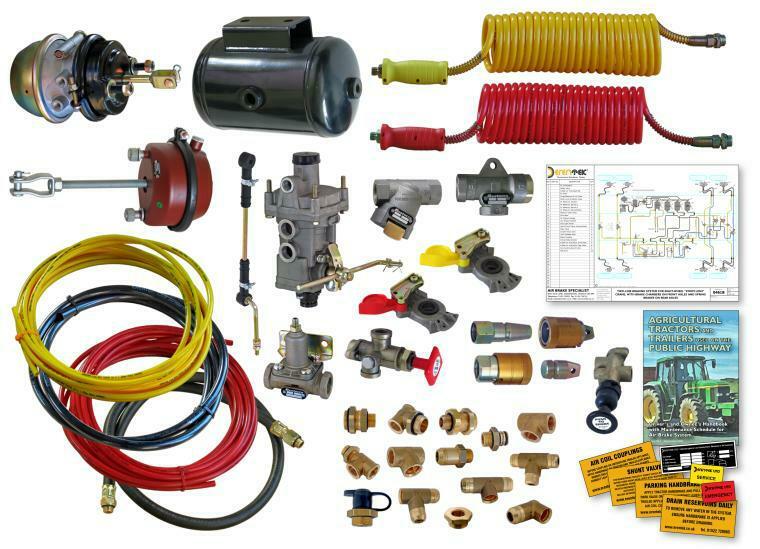 Addition of belt-driven single-cylinder air compressor, fluid-reaction valve, trailer-control valve and two-line air equipment for trailer brake control on tractor. Addition of belt-driven single-cylinder air compressor, powered by 12 volt electric motor, to JCB Telehoist, plus two-line air equipment for trailer brake control. Two-line air braking system, with third line addition, for tandem-axle semi-trailer, using spring brakes, park/shunt valve and combined load-sensing relay-emergency valve. 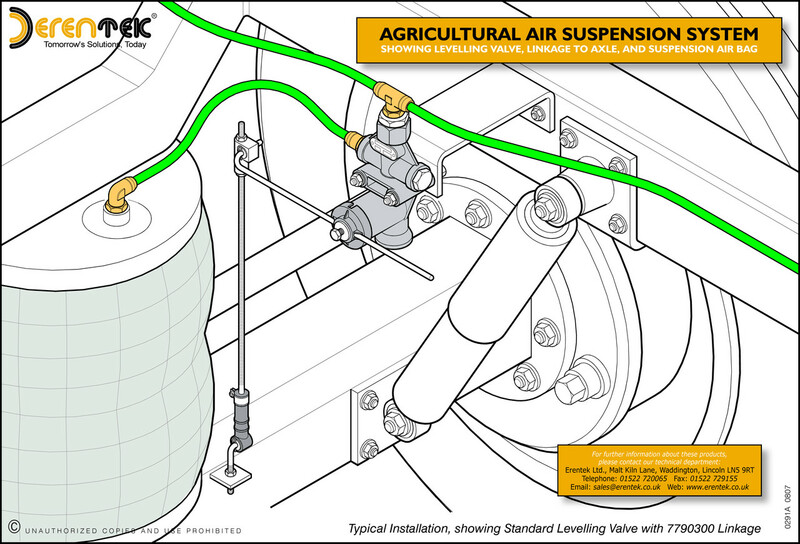 Agricultural air suspension system - part of typical layout. Air suspension system for tandem-axle trailer with two lift-axles, with independent lift control for each axle, with suspension-dump. Two-line air braking system for two-axle turntable trailer with spring brakes, brake chambers, 4S/3M 24-volt Modal ABS, park/shunt valve and load-sensing on each axle. Air/hydraulic braking system, with trailer air brake control, for two-axle towing vehicle. Two-line air braking system for single-axle baler, using single-diaphragm brake actuators and reservoir-mounted relay-emergency/shunt valve. Two-line air braking system for tandem-axle agricultural drawbar trailer, with disc brakes, spring brake actuators, air suspension and 2S/1M 12 volt Modal ABS. Air suspension system for single-axle trailed crop-sprayer. Addition of 12 volt air compressor and single-line trailer brake control equipment to towing vehicle, with modifications to braking system on towed vehicle. Addition of supplementary 12 volt air compressor and equipment to six-wheel Fiat van with air suspension on rear axles. Addition of central tyre-inflation system to agricultural vehicle, with tyre pressures controlled by push-button valves in cab. Two-line air braking system and air suspension system for tri-axle semi-trailer with extendable chassis. Two-line air braking system for five-axle Oshkosh truck. Two-line air braking system for six-wheel crane, using brake chambers and spring brakes.